Read through recipe before cooking. Place oven rack 4 inches from broiler element. Preheat broiler. Spread ricotta on bread, season with salt and pepper; place on baking sheet. Broil 2 minutes or until ricotta is warm. Remove from oven, top with tomatoes. Season tomatoes with salt and pepper and broil again for one minute. 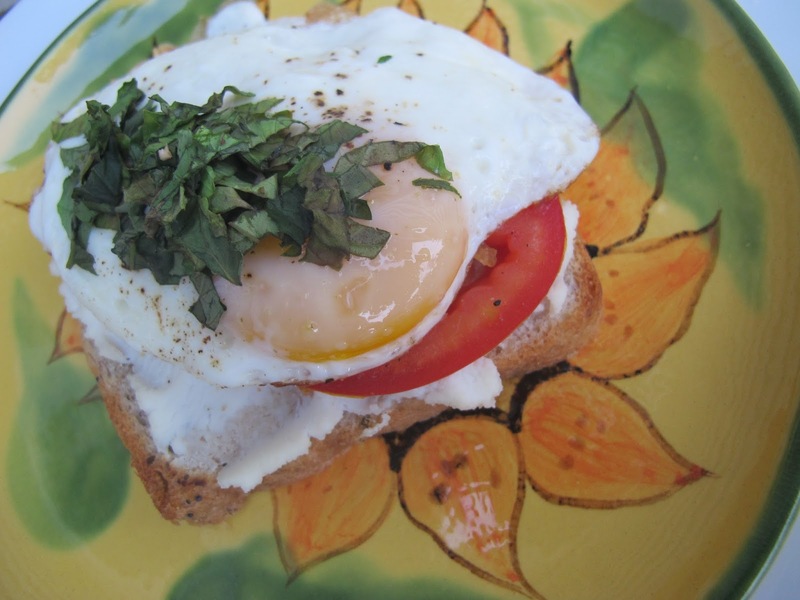 Add egg on top of the tomatoes and garnish with basil. Run under broiler briefly to finish cooking egg. 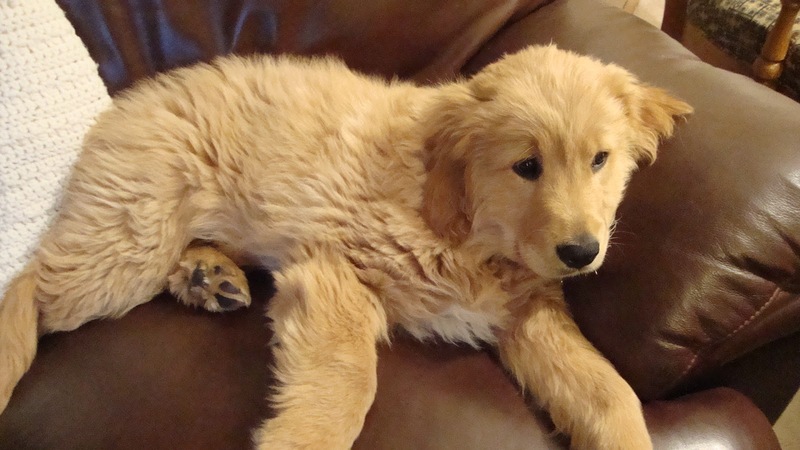 Just for fun for dog days, here’s Tucker the Pup in 2010. The heat we missed in early August when we had two weeks of temps in the 70’s arrived last weekend. With temperatures pushing 100 degrees Fahrenheit and heat indexes way over that, Saint Paul folk — typically able to withstand any onslaught of cold or hot weather–are wilting. (It’s State Fair time, too.) People who never complain about the weather are just about “under the weather” over this last blast of wet-breathing miasma. Those without air conditioning are leaving home in search of relief in friends’ homes or malls. When Dave and I gave up even grilling the other night and headed to Scusi, our favorite across-the-street wine bar, we found that the poor restaurant cooling systems can’t keep up with it either, though they gave it a valiant try. (It was bearable.) Of course, you have to figure there are pizza ovens, huge gas stoves, grills, and salamanders adding to the fray. The dripping server brought our happy hour half-price pizza and salad with a wan grin, but was clearly unhappy to be running around in the typical waiter garb: long-sleeved white shirt, black slacks, and apron. The rest of us had our muumuus on — or the male version thereof. “And where would that be?” asked Dave. I’m guessing we’re stuck in our basement with Netflix and a few cold beers or, if I’m lucky, lunch and an afternoon at Mall of America. The only time we approach that place is when it’s 20 below zero and we can’t look at each other across the living room one more afternoon or when it’s 95 and I need a walk and red wine in the same afternoon. I’m not sure we’ve ever bought anything there except maybe at Williams-Sonoma. I do need some dishes, though. And I’m listening to: MUMFORD AND SONS– 2 albums: Babel and Sigh No More. As I prepare for choir to start, I’m listening, over and over again, to our first (one rehearsal) anthem–which is a ’96 rendition of the 23rd Psalm by Stuart Townend. No scooping, though! Probably everyone’s sung it (we haven’t), but I adore anthems that congregations can participate in. Too often, we only hear the 23rd at funerals. Does anyone preach on it even when it’s in the lectionary? Actually, I rarely hear anyone preach the psalms. Pity. I love the people’s song prayers. Help the hungry in Syria? Like everyone else, I’m praying for peace in our world and food for the hungry–especially in Syria. If you’d like to contribute–something very positive to do when we think we can do nothing–contact the World Food Programme. 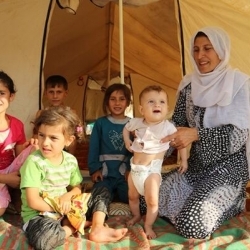 They’re getting food to Syrians in-country as well as in the refugee areas. Big Zuke (and other) Caprese + New Book Cover! 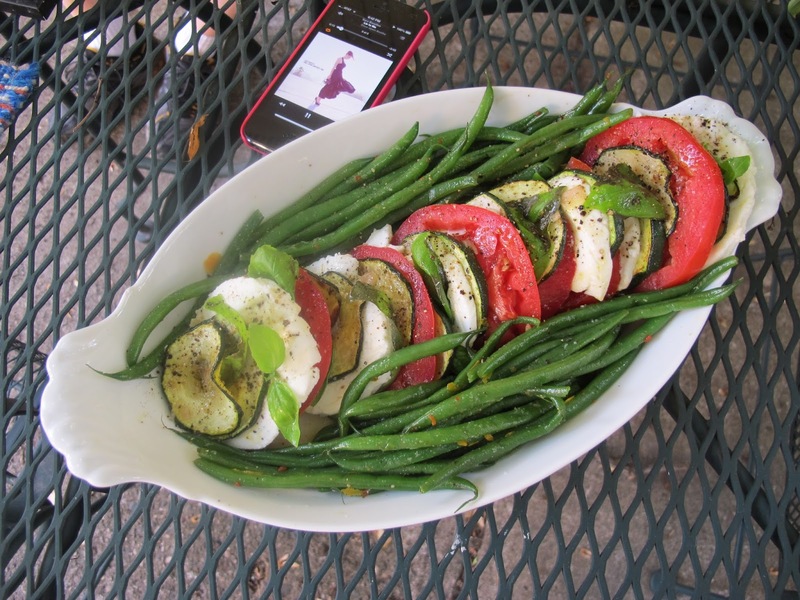 Huge zucchini–sliced very thinly and sauteed–then fanned into the caprese. I’d like to say this little meal came up during my salad days. But I can’t put that down without a little head tilt and one-sided smile. Come the dog days of summer–ah, geez– I have times when the grill isn’t quite as appealing as it was in, say May when the heat began. 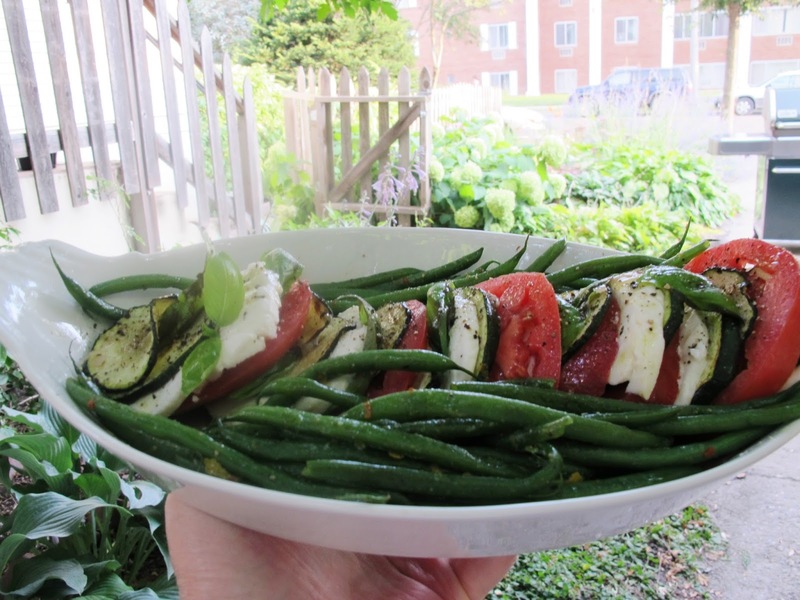 I’m more interested in what I can do with the vegetables from my neighbor’s garden or from the farmer’s market, or even from our own tiny patch–which is just tomatoes and herbs. I just want to sit under the tree with a quick, cold meal, a bottle of wine, and my husband. Making hay while the sun shines. Watching the grass grow. I also adore a bowl of some sort of spicy olives with caprese. Or you might add them to the platter for color and interest. 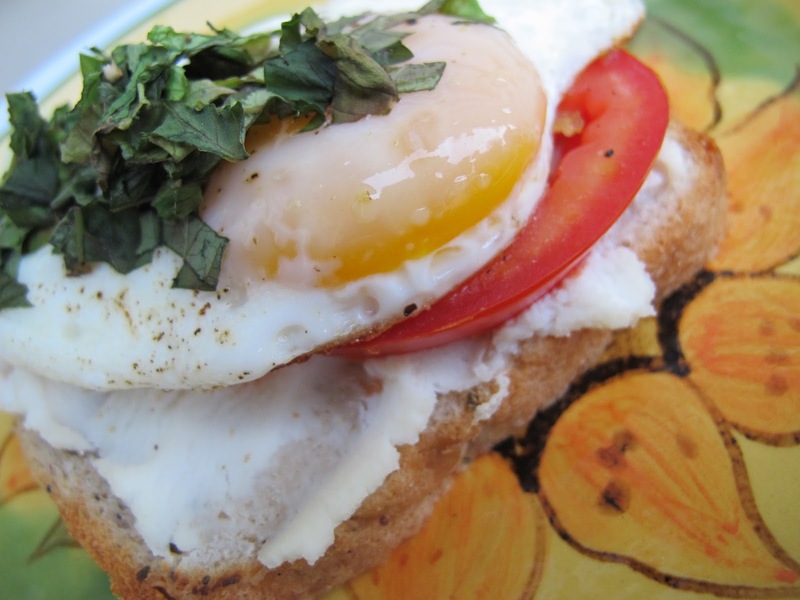 Grilled toasty bread is another lovely accompaniment so that you have the tender, sweet tomatoes along with the bite of the mild cheese against the crunch of the baguette. Bread needn’t be the bad fellow it’s so often made out to be, particularly if it’s whole grain. Layer tomatoes, cheese, basil, and cooked zucchini on a medium platter — either in a straight line or in a circle. 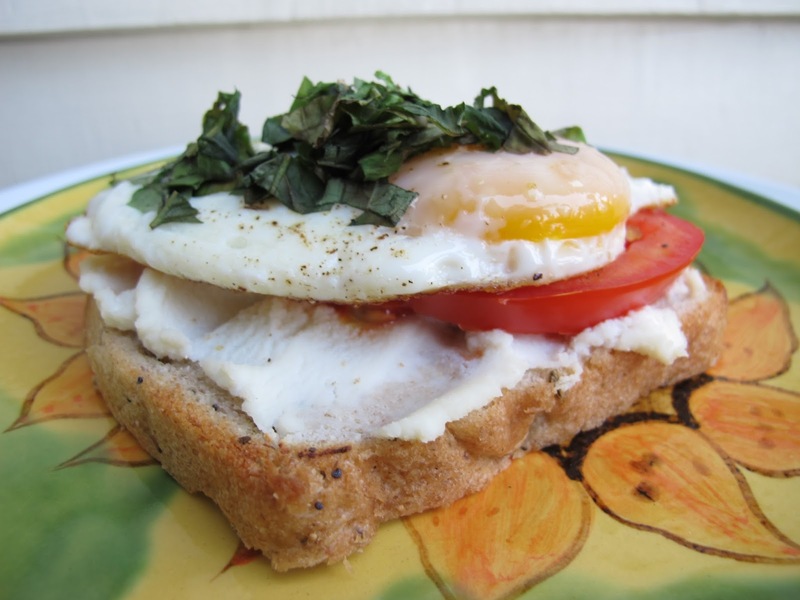 Layers needn’t come out perfectly even; stick extra basil, for instance, in wherever it looks good. Season well with salt and pepper and drizzle with vinaigrette. Add beans at sides or in center. Spicy Lemon Vinaigrette: Whisk well together 1/4 cup fresh lemon juice, 3/4 teaspoon Dijon-style mustard, a good pinch of salt, pepper, dried oregano and crushed red pepper. Drizzle in slowly 1/2 cup olive oil and whisk until well-combined or thickened (emulsified.) Taste and adjust for seasonings. Store in a jar with a tightly-fitted lid for several days. Easy patio music from my iphone. Wine: Drink something quite cold and crisp here. I like any rosé; it needn’t and shouldn’t be pricey. Make sure it’s a 2012; you don’t want old rosé. (My favorites are the very pale, oh-so-dry French ones. They might be a few bucks more.) If you’d rather a white, go with an unoaked, inexpensive Chardonnay or even a Viognier. Dessert: Go out for ice cream. You were so good; you deserve it! It’s only summer once. Just for fun, here’s a BBC2 video with Carol Klein about growing your own beans…. and other veg. 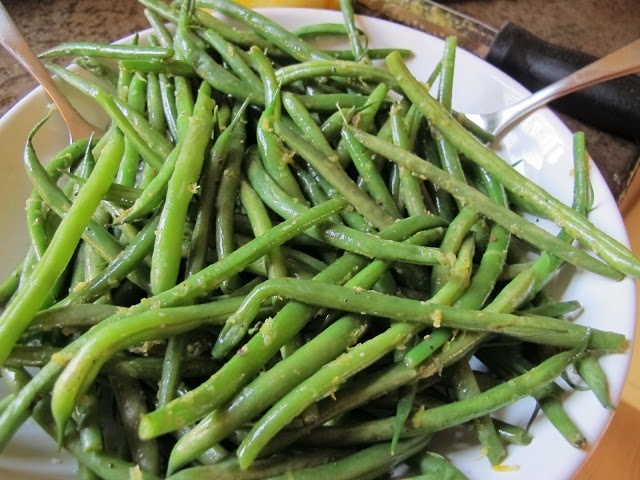 Just the same as the orange beans, but with finely grated lemon. These are a favorite snack at our house. 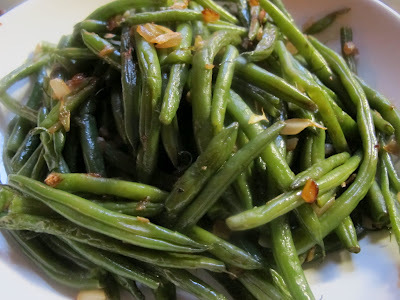 These beans, the larger sort, are steamed and then sauteed with butter, garlic and shallots. 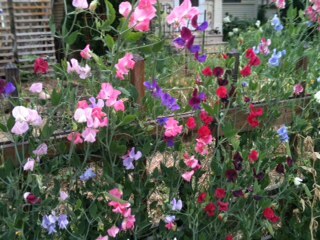 While nearly totally off subject, these are my victory garden neighbor’s sweet peas. Love them! It won’t be long now; the book’s almost ready. She said. 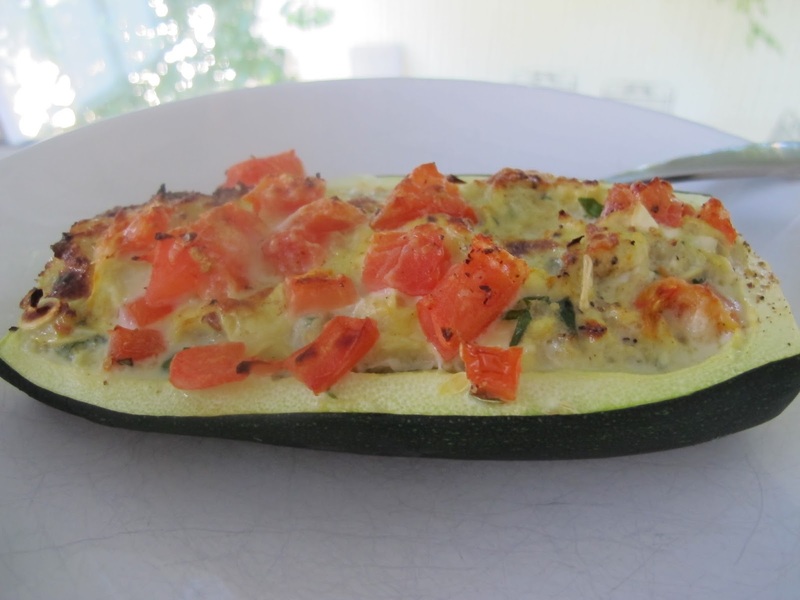 One big, scooped out zucchini filled with scrambled eggs, onions, basil, tomatoes+cheese. Breakfast on the porch Just add newspaper + coffee. Just for fun, take at look at the LA Times, who published the above photo on #weekendeats !!! 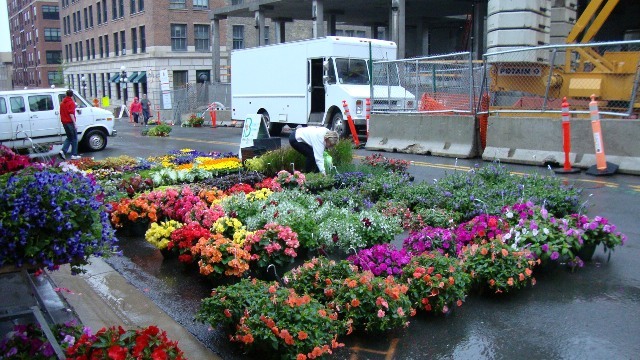 In Saint Paul, we have a plethora of farmer’s markets. Naturally the best–or largest– is on Saturday mornings downtown. And, if you’re hungry, you can have a great breakfast sandwich and a big coffee from Golden’s Deli. But if you don’t have the time or the inclination (it’s crowded), you can go to one of the other markets. On Thursdays, you can go to the Capitol. It’s a small market, but is full of the best of the best. Like tomatoes. Chard has a slightly bitter taste and is used in a variety of cultures around the world, including Arab cuisine. 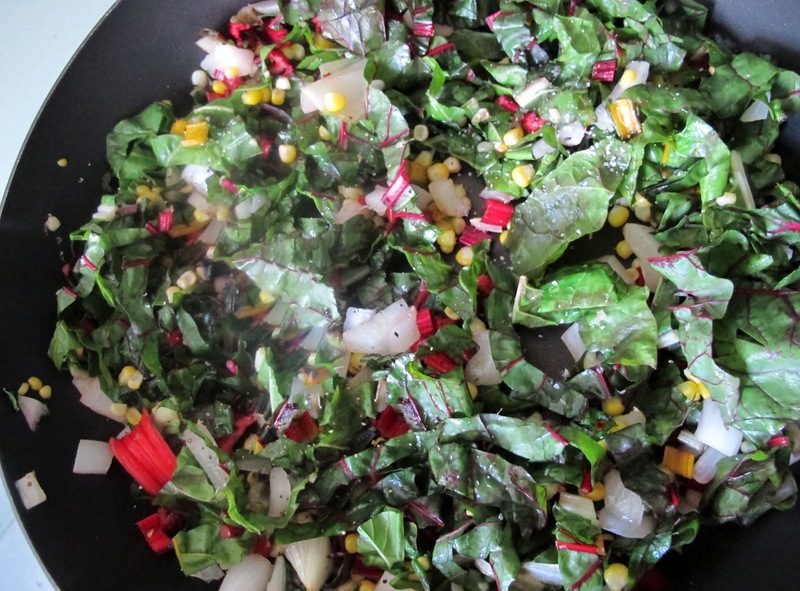 Fresh young chard can be used raw in salads. Mature chard leaves and stalks are typically cooked (like in pizzoccheri) or sauteed; their bitterness fades with cooking, leaving a refined flavor which is more delicate than that of cooked spinach. Nutritional chart at bottom. Last Thursday, my friend Kim drove me down to the Capitol for a quick market shop. As always, I bought way more than I needed, but out of that great bounty came this sweet side… The tomatoes are from my own garden. Leftovers? 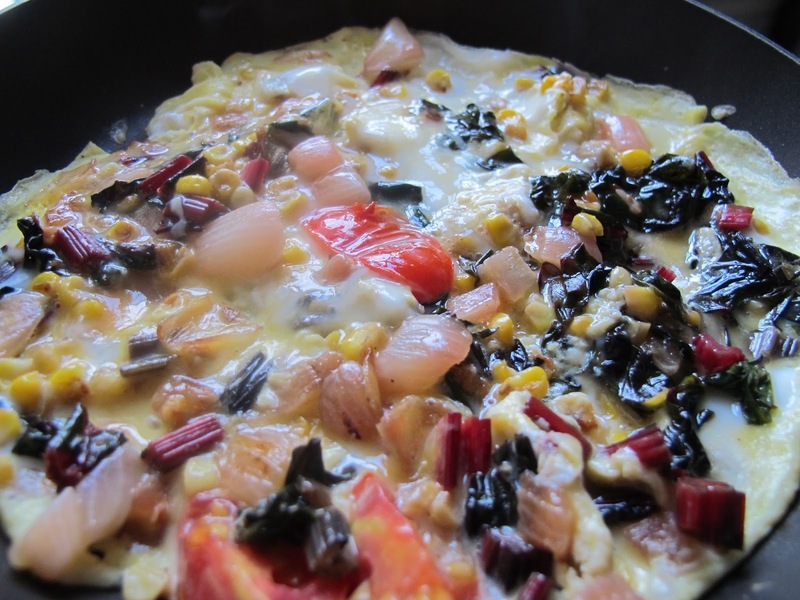 Heat up a small skillet, add about a half-cup of the chard mixture and let warm through. Stir in two well-beaten, seasoned eggs and let cook until eggs are done to your liking. Breakfast is served. Leftovers with eggs for breakfast. In a large, deep skillet, heat oil with red pepper over medium-high heat for thirty seconds. 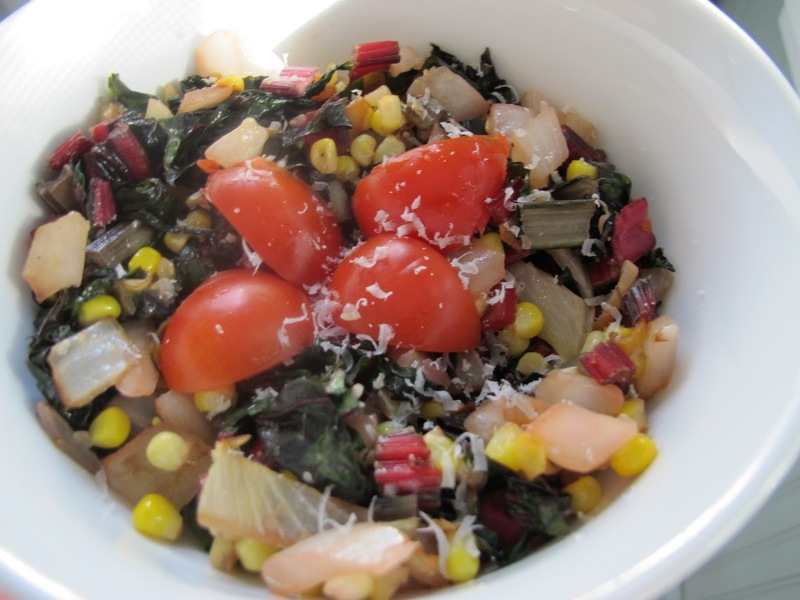 Add onion and corn, stir, and cook 2-3 minutes or until vegetables are just softening. Stir in chard and season generously with salt and pepper. 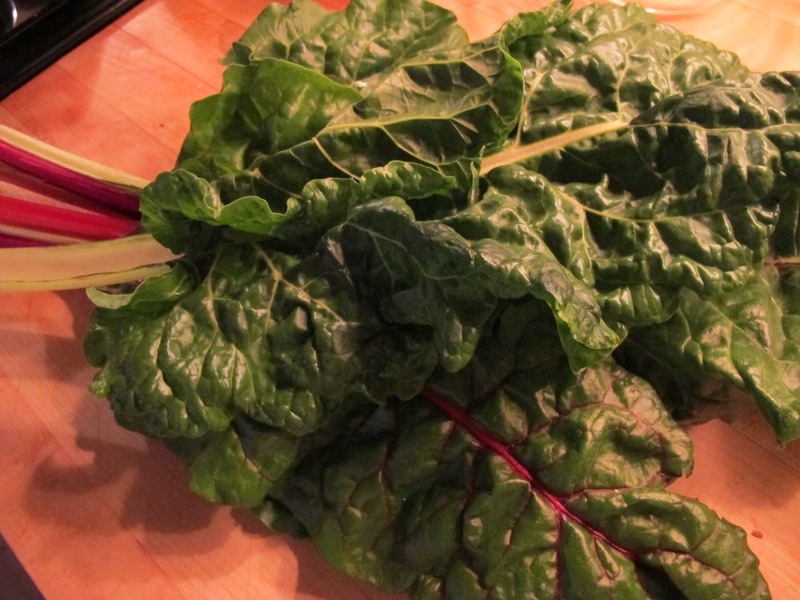 Cook for 4-5 minutes or until chard is tender, and has wilted. Add garlic, Parmesan, and tomatoes. Let cook 1-2 minutes. Serve hot with a few ounces of rare beef filet, medium-rare pork tenderloin, or with sauteed wild mushrooms stirred into Minnesota wild rice. Garnish with a bit of Parmesan and the rest of the tomatoes. All parts of the chard plant contain oxalic acid.Swiss chard is high in vitamins A, K and C, with a 175 g serving containing 214%, 716%, and 53%, respectively, of the recommended daily value. It is also rich in minerals, dietary fiber and protein. 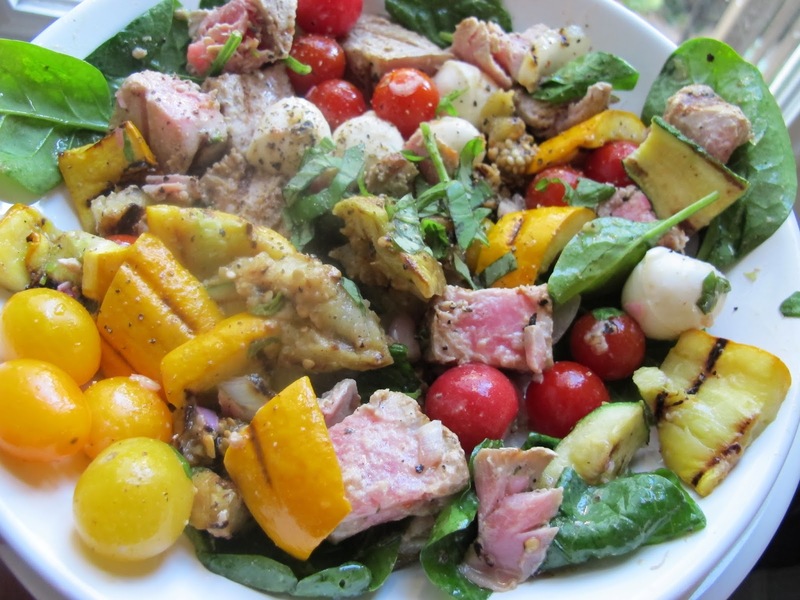 I’m not sure there’s anything like a summer salad that appears to be a Niçoise-Caprese mix. It’s the best of summer flavors combined and makes you feel as if you’re in Italy and France at the same time. 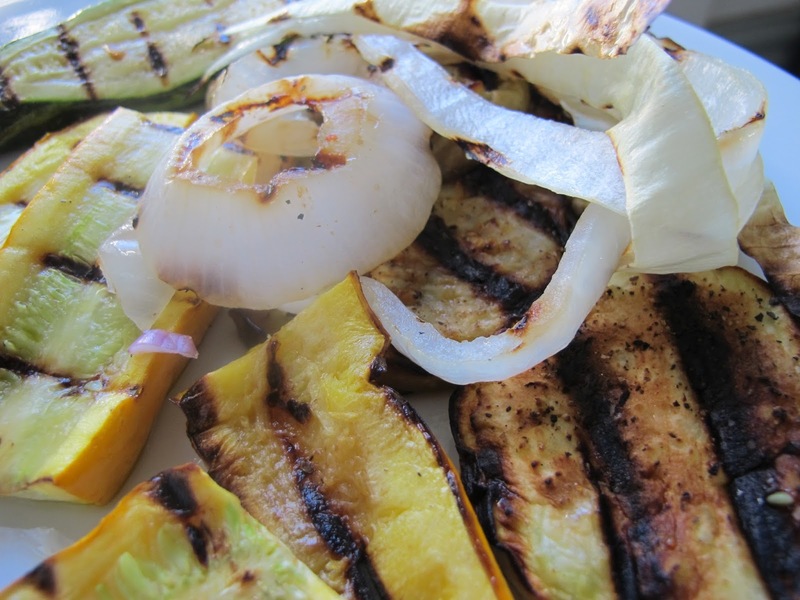 Especially if you’ve added grilled eggplant and zucchini along with a lemon-basil vinaigrette. Preheat indoor or outdoor grill over medium-high heat. Brush eggplant, zucchini, and onion with olive oil and sprinkle generously with salt and pepper. Grill about 8 minutes, turning once. Remove to a plate and set aside. After a few minutes, slice into one-inch pieces. Brush tuna with oil and sprinkle with salt and pepper. Grill 2 minutes on one side until there are dark grill marks; turn and grill other side about 2 minutes for medium rare – rare, depending on the thickness of the tuna. Cook another minute or two for medium-well. Remove and let rest 1-2 minutes. Cut into one-inch chunks. 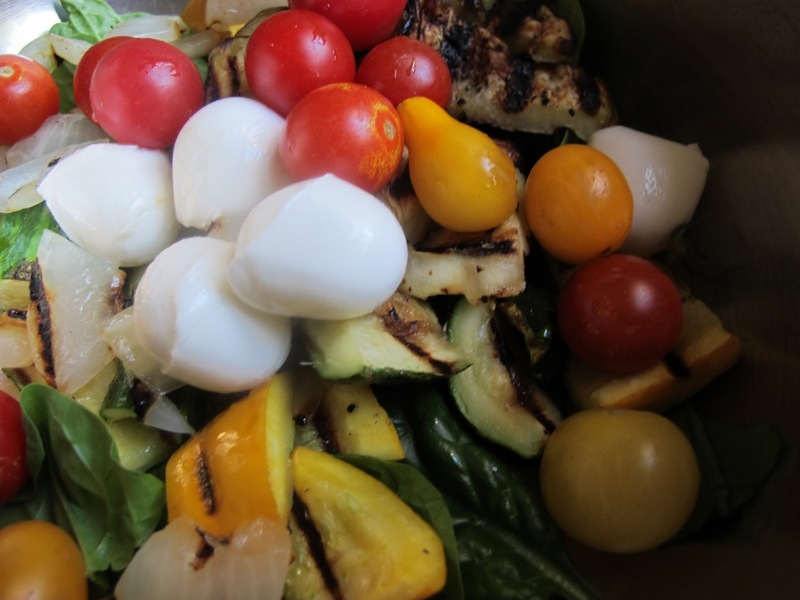 To a large bowl, add tomatoes and boccocini (small mozzarella balls), spinach, olives, and sliced eggplant, zucchini, and onions. Stir gently and drizzle with a bit of lemon juice; add tuna and stir again. Drizzle with remainder of lemon juice and then generously with vinaigrette. Divide between four pasta or shallow bowls, placing cherry tomatoes in one section, cheese in another, and so on. Garnish with olives and reserved basil julienne. Serve warm or at room temperature.Cook’s Note 1.: If you’ve a large enough grill, grill the vegetables and add the tuna during the last few minutes. I made this on a big cast iron indoor grill that covers two burners (Lodge), but it still wasn’t big enough for everything. Add to that, I’m only an indoor griller and like things in manageable batches. I leave the big gas or charcoal grill to Dave or whomever I can lasso into firing it up. 2. 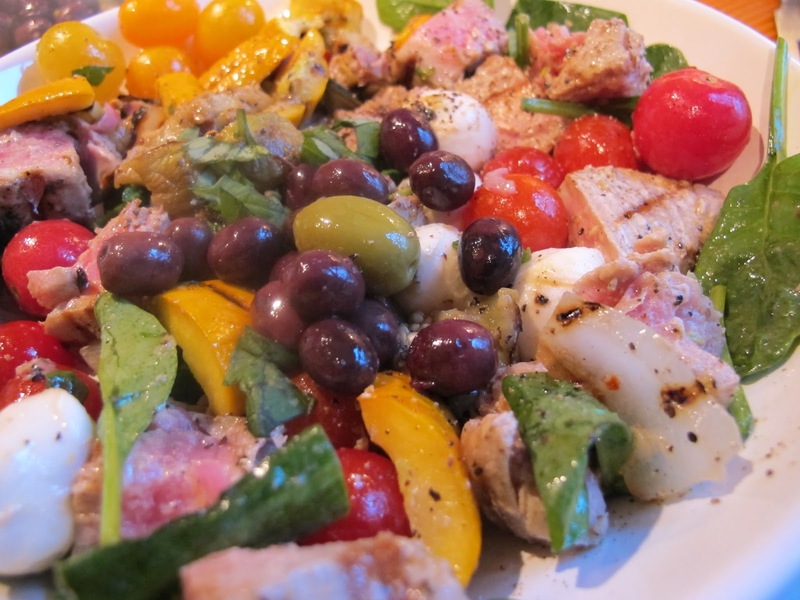 If you’d like a bit heartier salad, stir in a 15-ounce can of drained cannellini beans (season first pepper and with a bit of the vinaigrette) along with the grilled vegetables. Fresh sliced cherry tomatoes are hidden at the bottom of the bowl for a surprise. 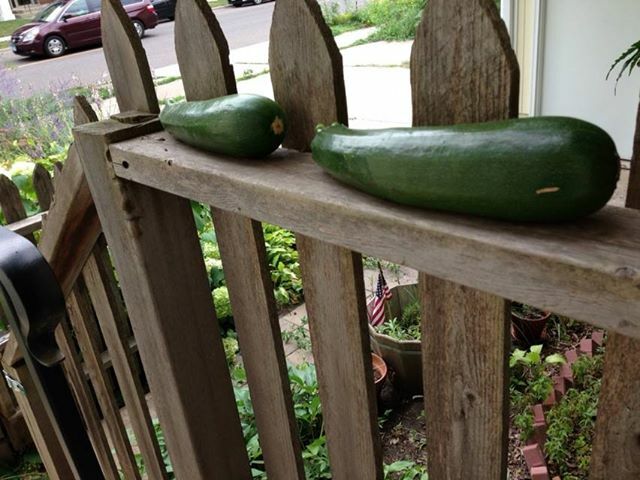 There may be more recipes for zucchini than anything else at this time of the year. Long gone are the tiny, tender and sweet pencil-slim squashes of early summer. Here now are baseball-bat sized –could I say clubs?–appearing on back porches, in countless loaves of bread, stuffed and broiled, or any of the above. 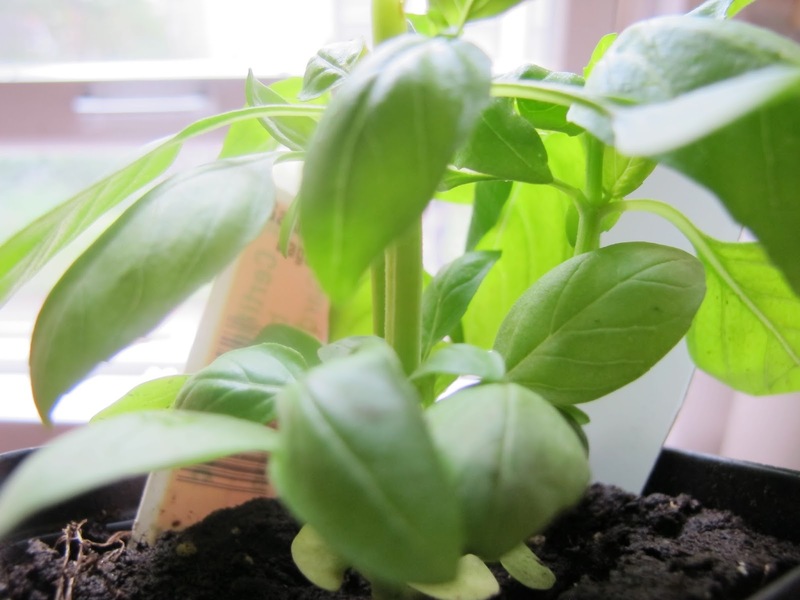 My basil died while I was gone. Market had plants 3 for $10 this week. I’m starting over. 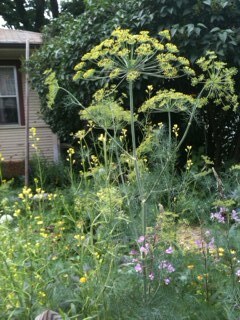 Flowering dill. If you live where dogs take a lot of walks, wash your herbs carefully! 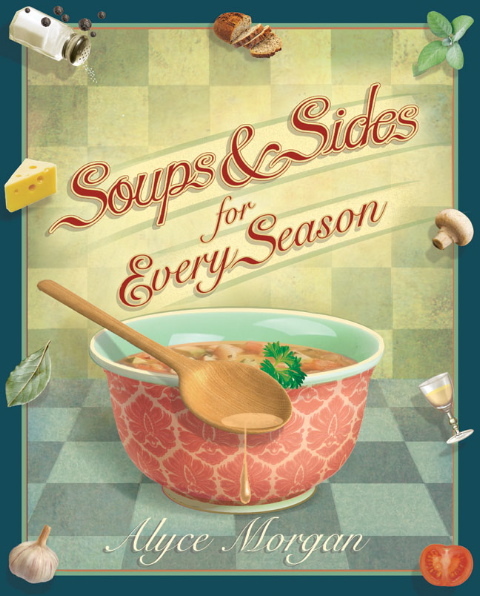 This simple, herb-filled soup is lovely hot or cold (see Cook’s Notes) and contains a surprise of fresh tomato added to the bowl just before serving. 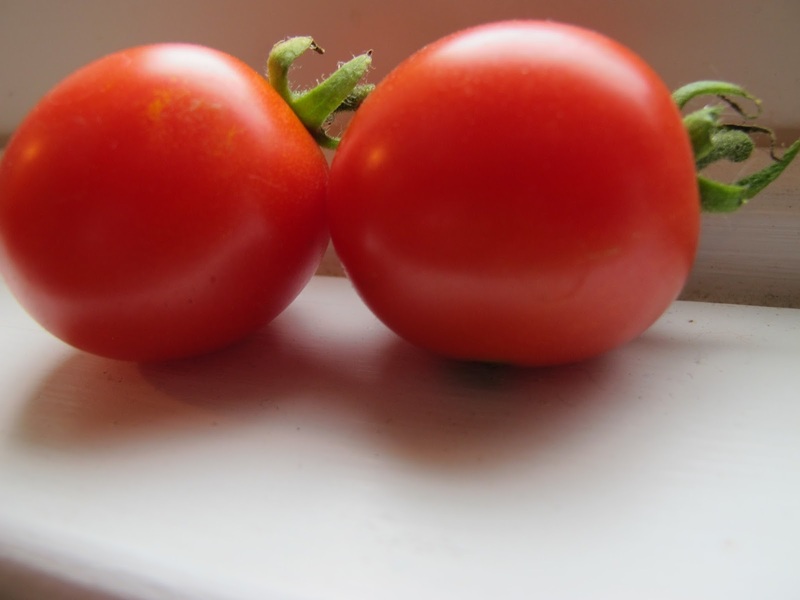 The tomato cooks slightly in the hot soup or provides even more textural contrast in the cold. 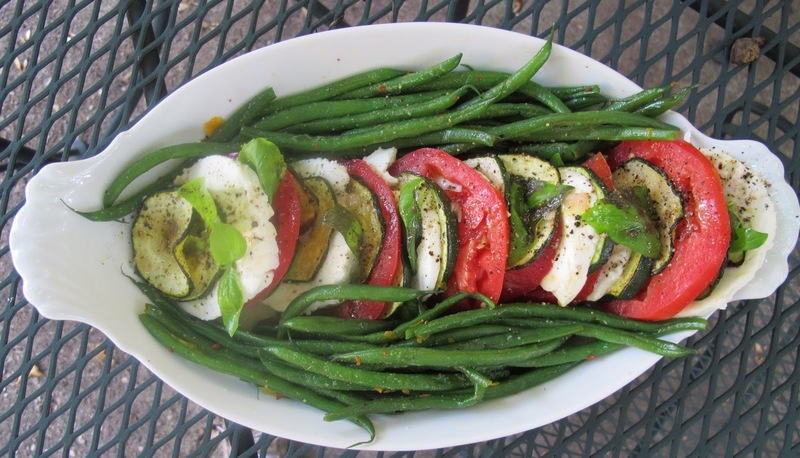 Along with some sliced fresh vegetables or whole wheat toast, this is a complete summer meal. While it does contain some half and half and grated Parmesan, the calories are fairly low if you’re serving no other protein. For vegan option, use vegetable broth and omit cheese and half and half. Briefly heat (30 seconds) 1/2 teaspoon black pepper and olive oil in an 8-quart Dutch oven over medium heat. 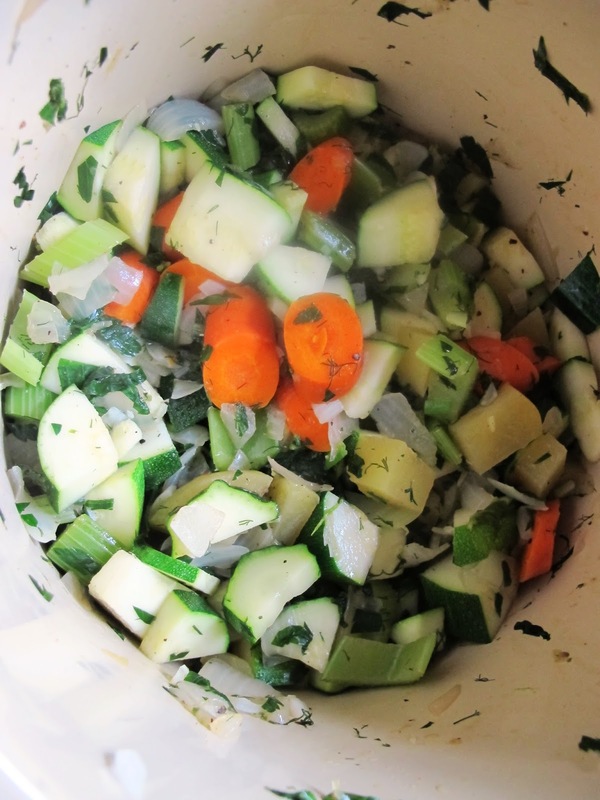 Add onion, celery, carrots; season with 1/2 teaspoon kosher salt and 1/8 teaspoon cayenne. Stir in basil, thyme, parsley, dill, and bay leaf. 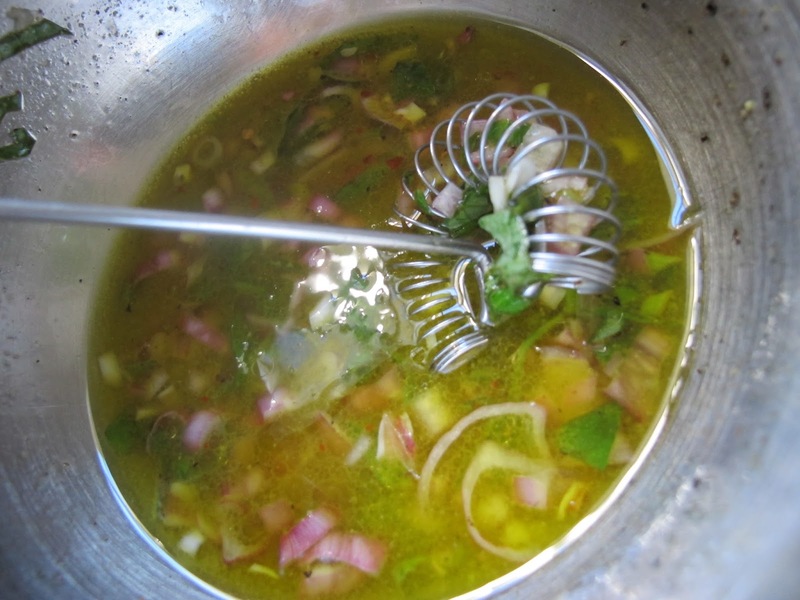 Let cook, stirring often, 5 or 6 minutes or until softening, adding garlic during last minute or two. Add zucchini and potatoes; heat through. Pour in broth, cover and bring to a boil. Lower heat to a simmer and cook until vegetables are tender–another 15 minutes or so. Remove bay leaf. Using an immersion blender, puree in pot or very carefully pulse in batches in a blender or food processor and return to pot. Taste and adjust seasonings. Stir in Parmesan and half and half, if using, and warm through. Do not boil. 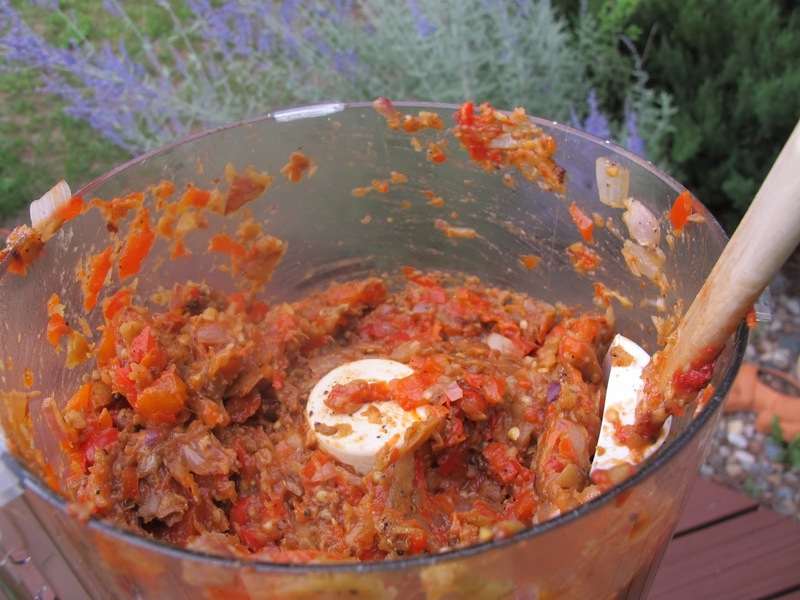 Add a few fresh sliced or chopped tomatoes to each bowl; ladle soup over tomatoes. Garnish with reserved basil. Serve hot. *Most any one herb or any combination will work if you don’t have all three in the garden. Cook’s Notes: For cold soup, let come to room temperature after adding cheese and cream, if using. Chill for 8 hours or overnight, and garnish with tomatoes and basil when serving. 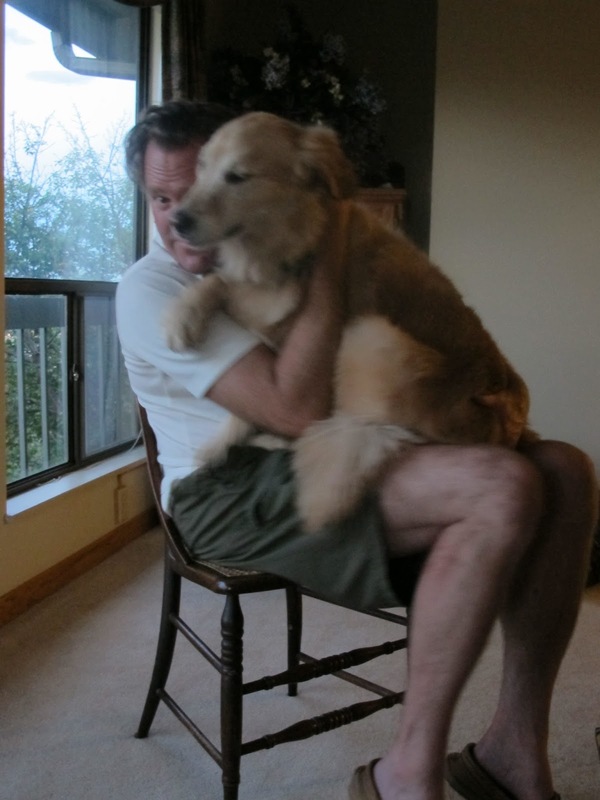 At our Colorado house, Tucker (75 pounds) in neighbor Mike’s loving lap. and so on. The show sometimes drives along with Ina into town to pick up the ready-to-go food and I have to admit I’m always jealous of the shops she has available. Her point is often that if you have too many nibbles with your apertif or sparkler, you’re full. 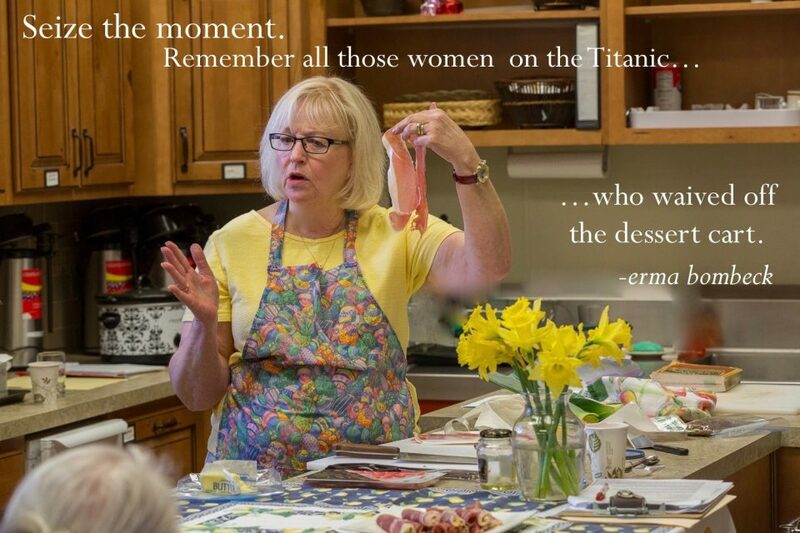 Not only that, who wants to spend not only the whole day getting ready for company, but making yet another recipe? I not only agree with her, I follow those rules for entertaining and make things easy on myself. I’ll also admit I adore potato chips and champagne. In fact, I looked back at the Food Network site and even found a little video of Ina waxing poetic about three silver bowls filled with purchased goodies for Thanksgiving: nuts, chips, and caper berries. Just to get my head on straight (quite a feat), I went to the master book index (all of Ina’s cookbook recipes indexed in one spot) on barefootcontessa.com and discovered that, at least in the cookbooks, there still are quite a few “made” appetizers, starters, or hors d’oeuvres –whichever is your favorite term. The majority contain protein of some sort–chicken, salmon, cheese, or lamb. While I’m an omnivore and definitely a carnivore, I rarely choose meat (good pun, huh?) to go along with a cocktail, mixed drink, or first glass of wine. I save my protein calories for main courses and usually am happy to have vegetables early on. 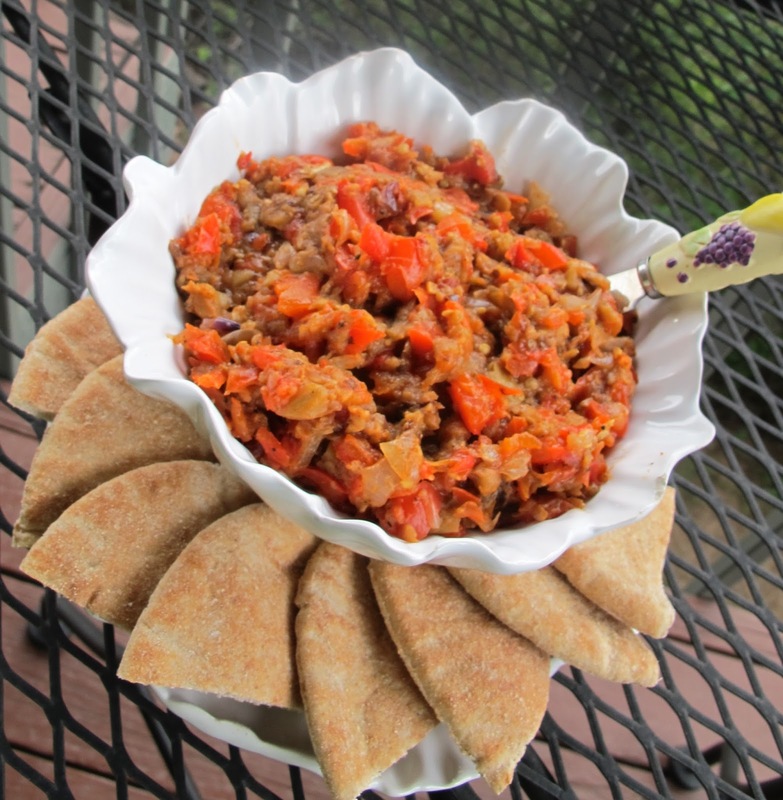 So when I came across this gorgeous eggplant mash, I jumped on it. 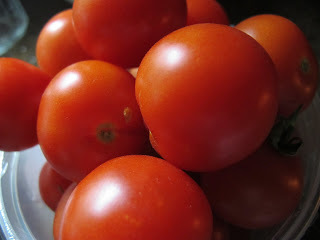 I thought it would go with a variety of drinks, would be healthy, inexpensive, beautiful, fun, and definitely in season. 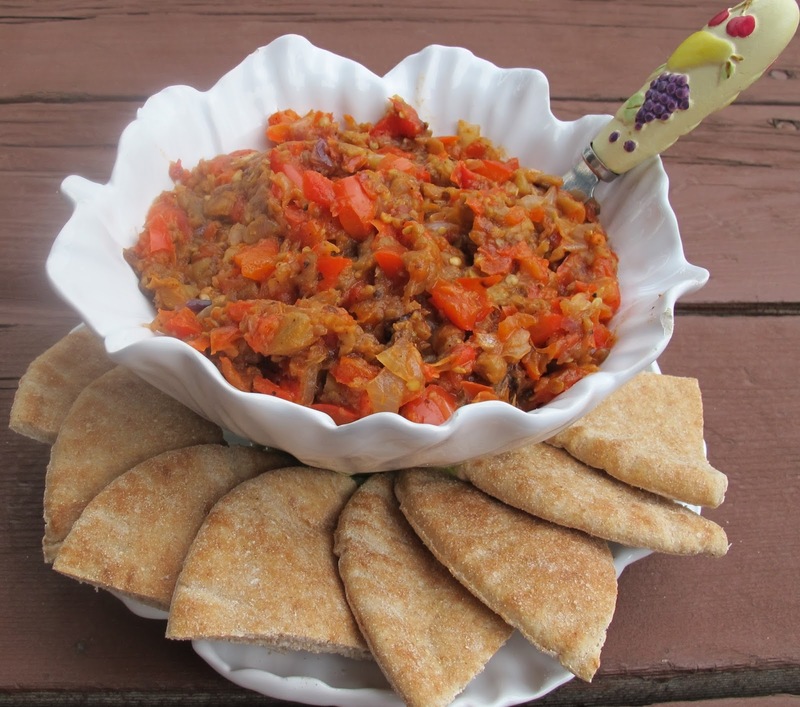 Hungry guests could scoop up the eggplant spread with a piece of grilled pita; slimming friends could use a celery stalk or a big slice of carrot. The day was so pretty I took the work bowl outdoors to photograph it in front of my Russian Sage–which is each year but this one typically full of bees. Only one or two right now. Very sad. 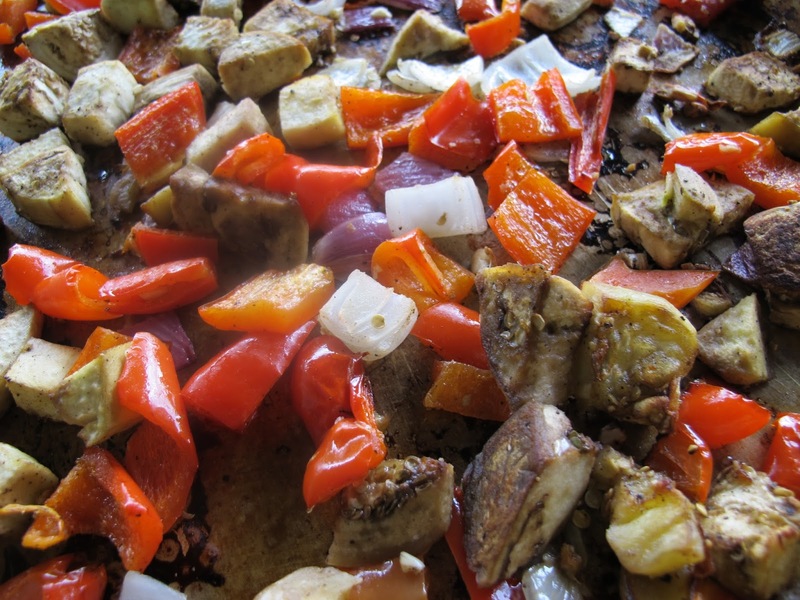 Cut the eggplant, bell pepper, and onion into 1-inch cubes. Toss them in a large bowl with the garlic, olive oil, salt, and pepper. Spread them on a baking sheet. Roast for 45 minutes, until the vegetables are lightly browned and soft, tossing once during cooking. Readmore at the food network site. The first Friday of the month, food bloggers from many parts of the world join together in posting a favorite Ina recipe. This month we have appetizers, next month is Salads, Soups and Sides. Are you a food blogger? We’d love to have you! Want to join in one time a month? Email Alyce @ afmorgan53@yahoo.com or link in to join us once in a while (click on blue oval link button at bottom and follow prompts) only if you’re blogging Ina! No other posts, please?! Sing a new song; cook a new appetizer!